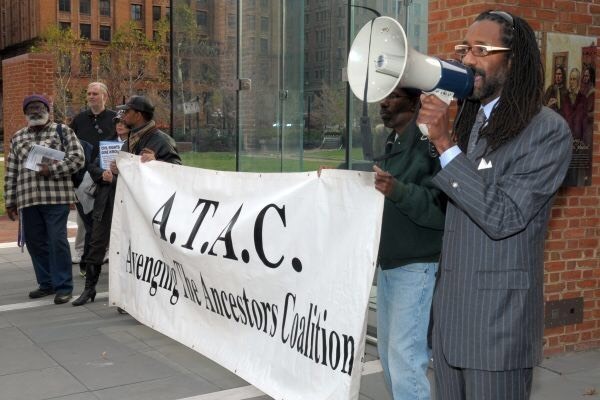 Avenging The Ancestors Coalition (ATAC) is a broad-based organization of African American historians, attorneys, concerned citizens, elected officials, religious leaders, media personalities, community activists, and registered voters. Based in Philadelphia, its influence is international. ATAC was founded in 2002 to compel the National Park Service (NPS) and Independence National Historical Park (INHP) to finally agree to the creation of a prominent Slavery Memorial to conspicuously permeate the President’s House project. The purpose of the Slavery Memorial is to honor primarily the nine African descendants enslaved by President George Washington at the President’s House, which is also known as America’s first “White House” and which was located at the current site of the new Liberty Bell Center in Philadelphia at Sixth and Market Streets. Those nine were among the 316 Black men, women, and children enslaved by Washington at his Mt. Vernon, Virginia plantation. ATAC won the battle for the historic President's House Slavery Memorial to honor our courageous ancestors who were enslaved by President George Washington at America’s first “White House,” which was in Philadelphia at the current site of the new Liberty Bell Center at 6th and Market. ATAC is winning the ongoing and reactivated battle to get Dr. Edward Robinson’s African-centered 'Infusion' educational project permanently and pervasively infused into the Philadelphia school district’s official curriculum. Through its “NOT Over Our Dead Bodies!” Committee, ATAC is leading the battle to end the desecration of The Bethel Burying Ground. This is the cemetery containing the remains of at least 5,000 Black men, women, and children from the 1800s that are defiled under a trash dump and a city playground in South Philadelphia. ATAC is assisting “Heeding Cheyney’s Call” in the battle to save Cheyney University- the oldest Black institution of higher learning in America- from decades-long racial discrimination by the Commonwealth of PA.
As we avenge the ancestors, we also support the living. ATAC is ready, willing, and able to form any committee to assist you with any battle that’s important to you for the protection of our ancestors, our people, and our community- but you must be willing to lead that committee! What Have We Accomplished Regarding The Slavery Memorial/President's House? ATAC spearheaded a letter-writing campaign, garnering over 15,000 signatures. 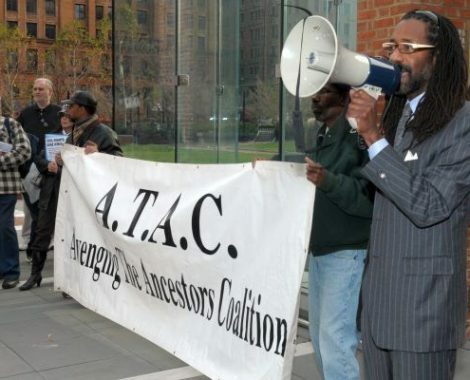 ATAC held large and vocal demonstrations annually, usually on July 3, from 2002-2007, in connection with the Slavery Memorial/President's House project. In October 2003, ATAC helped secure $1.5 million from Mayor John Street of Philadelphia toward funding the Slavery Memorial/President's House project. ATAC provided substantial documentation to U.S. House Appropriations Committee member Congressman Chaka Fattah of Pennsylvania who was instrumental in securing an amendment to the Interior Department's 2003 budget requiring the National Park Service to develop plans for the Slavery Memorial/President's House site, including an "appropriate commemoration" of the nine enslaved African descendants there. In August 2005, primarily through the efforts of Congressman Fattah along with the assistance of Congressman Robert Brady of Pennsylvania, $3.6 million in federal funding was made available for the site and the commemoration. 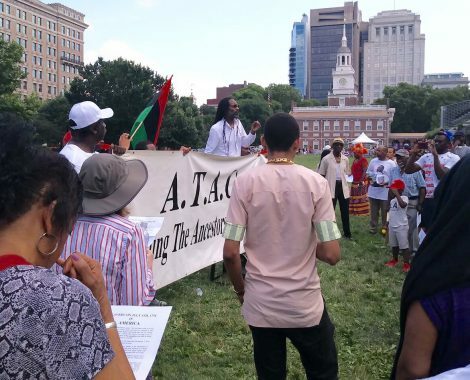 Portions of the 2017 annual Avenging The Ancestors Coalition's (ATAC) Fourth of July rally at Independence Mall dedicated to telling the truth about US history, slavery and the "founding fathers".